Burmese verbs ကြိယာ | kri1-ya2 do not change tense like in English. Instead, verb-suffix words are appended to show the past tense, present tense, and future tense. ကျွန်တော်ဆရာဝန်ပါ။ | kja1-nau2 hsa1-ya2-woon2 ba2 —	I am a doctor. Myanmar grammar has a number of suffixes and ending words called ဝိဘတ် | wi1-but (postpositional markers) and ပစ္စည်း | pyit-si3 (particles). Those suffix and ending words are placed after a noun or a pronoun to show subject or object, and after a verb to show tense or mood. Sometimes, they can modify the adjective into verb. 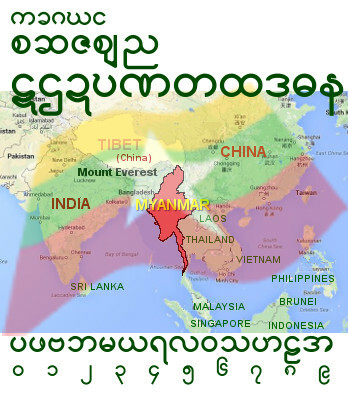 သွားတော့မယ်နော်။ | thwa3 dau1 meare2 nau2 —	I am about to go! သိ ပြီ လား | thi1 byi2 la3 —	Do you know now? သူ မှန် တယ် | thu2 hmun2 deare2 —	He is right! In the last example, the ending word IS NOT a verb, but it modifies the adjective into the word မှန် တယ် | hmun2 deare2, which is considered as a verb of pfyit-chin3-pya1 kri1-ya2 (verb clause that shows occurrence) type. Although တယ် | deare2 seems to correspond with the verb "is", it cannot be used consistently as "is" in some other sentence constructions. ဟုတ်တယ်။ | hote deare2 —	Yes! 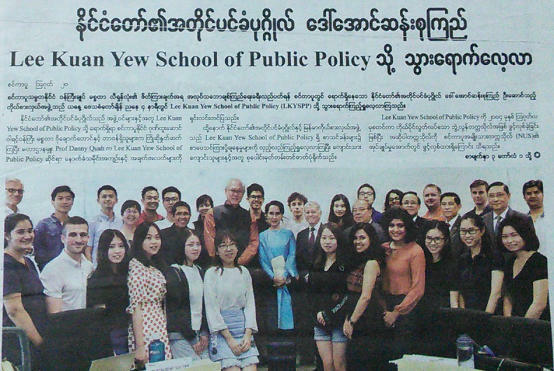 It must be stressed that Burmese equivalent of "be/is/are/am" like တယ် | deare2 are not verbs but post-positional markers, and they form verb clauses only in combination with verbs such as "go", "eat", "come", or adjectives such as "white", "wrong", "hungry". Similarly, ending particle words such as ပါ | ba2 when combined with nouns like "doctor", "man", "Buddhist", become equivalent to English "be/is/are/am" something or someone. In some other sentence constructions, they cannot be translated as English "be/is/are/am", and this can be confusing to non-native learners of Myanmar grammar. E.g., စာအုပ်ဆိုင် | sa2-oat hsine2 (book + shop) —	bookshop. It is possible to combine words other than nouns. E.g., စားသောက်ဆိုင် | sa3 + thout + hsine2 = eat+drink+shop = restaurant. E.g., ခွေး | khway3 —	dog. E.g., ထူးချွန်မှု | htu3-choon2 hmu1 —	the quality of being outstanding. This word is formed by the verb htu3-choon2 meaning "be outstanding" modified into a noun by the suffix particle hmu1. E.g., ကူညီမှု | ku2-nyi2-hmu1 —	help. The particle hmu1 modifies the verb ku2-nyi2 (to help) into a noun "help". This is unlike English where "help" can be either a verb or a noun. 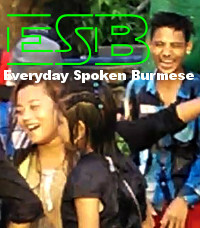 E.g., အစည်းအရုံး | a-si3-a-yone3 —	union, league. Unlike in English where most people will have to look up the dictionary for the plural of "octopus", Burmese plural words ဗဟုဝုစ် | ba1-hu1-woat in most cases simply add a suffix word တွေ | dway2 to the noun in the colloquial language and များ | mya3 in the literary form. Those suffix words are classified as particles. Burmese language has several conjunctions known as သမ္ဗန္ဓ | thun2-bun2-da1 Those conjunctions in colloquial forms are slightly different from their literary counterparts. They are similar to conjunctions in English Language such as "if", "or else", "therefore", "however", "moreover", "in order to", "so as to", "for", "as if", "also", etc..
မ | Ma1 = sounds like "Ma" in "Malaysia"
မာ | Ma2 = "ma" as in "diploma"
မား | Ma3 = higher pitch of "Ma" as in "Mother"
Hi, my name is Naing Tinnyuntpu | နိုင်တင်ညွန့်ပု | nine2-tin2-nyoon1-pu1. 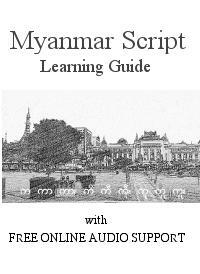 This website offering free online burmese lessons has expanded and improved through the years. It has started out just for fun without any audio or script, but now it includes more serious grammar materials. I wish you good luck and have fun.